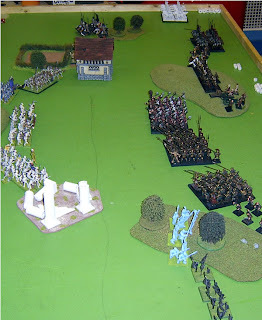 Much like my recent Warhammer game as undead, the result hung on a calculated gamble and a dice roll or two that crucially failed to go my way. I made use of the new undead advance rules to rush across the table; under the latest tweak of the Kings of War (KoW) rules, undead have something of the Celtic Warband about them, with an ability to cover ground swiftly. 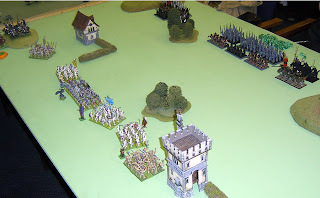 Ross saw a chance for his cavalry to take a horde in the flank and did so, but like baiting the enemy queen with a Rook, it was - I like to think - a well conceived trap. 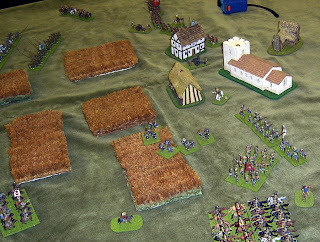 Unlike Chess though, in wargames nothing is so certain, Ross' knights did their work but looked set to be destroyed by a rear charge that would leave his centre in disarray. 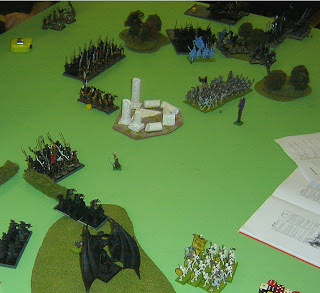 But when the undead magic needed only three rolls of 4 on eight D6 to make it's crucial charge, I got only two. Lesson learned, don't expose you flank, produce a steady advance unless your enemy exposes his flanks to you. The chap on the left is nominally a Dogs of War commander of crossbows; but he had no right arm, so I sourced a replacement from the spares box. 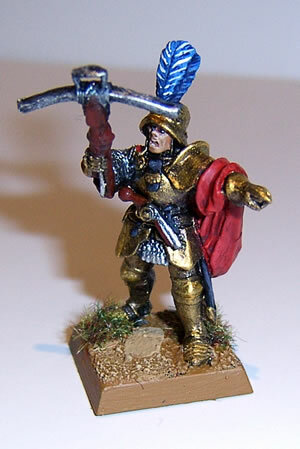 The other an approximately 25 years old Grenadier Barbarian, who can on occasion take command of the Norse. 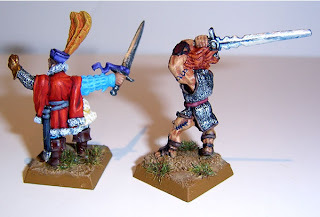 Overall, I'm quite happy with the bright finish of these two, which I tried to keep fairly simple. I did however add a few tattoos to the barbarian. 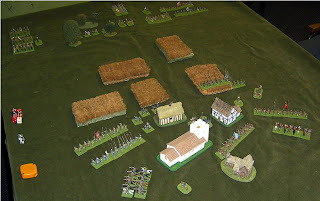 Well, I was singularly unimpressed by the last set of Napoleonics rules I tried, but Neil proposed we gave yet another set a go, after all there are plenty about. Song of Drums and Shakos is a neat little set which manages to get reasonable subtlety from a simple set of game mechanics. 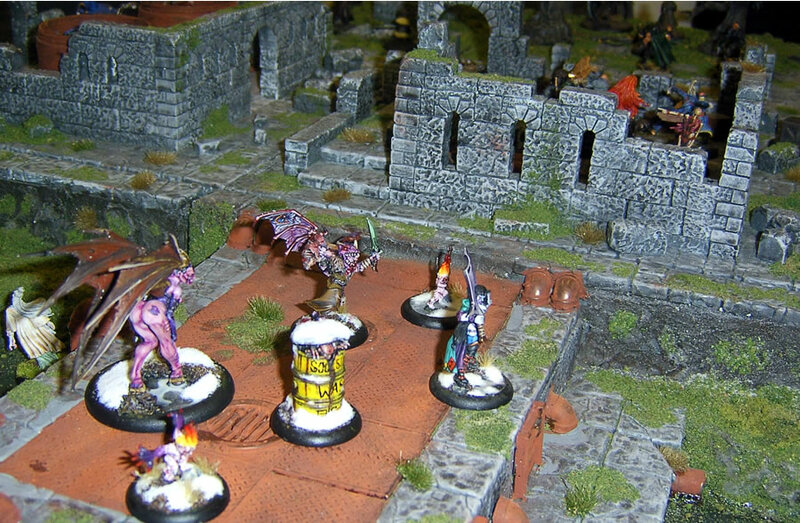 There is enough detail to make for the variety you want for a skirmish game, but it is not so complicated as to be down to individual combat. We've been trialling it for our display game at Pudsey Recon, and it works pretty well. 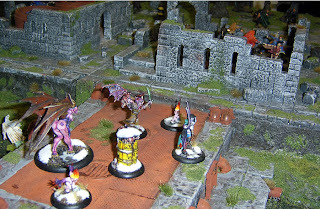 Essentially a model can attempt between one and three actions in a turn, and rolls against it's command rating to see how many successes you get. For each success you get one action, and for commanders this can include giving group orders to units of men. 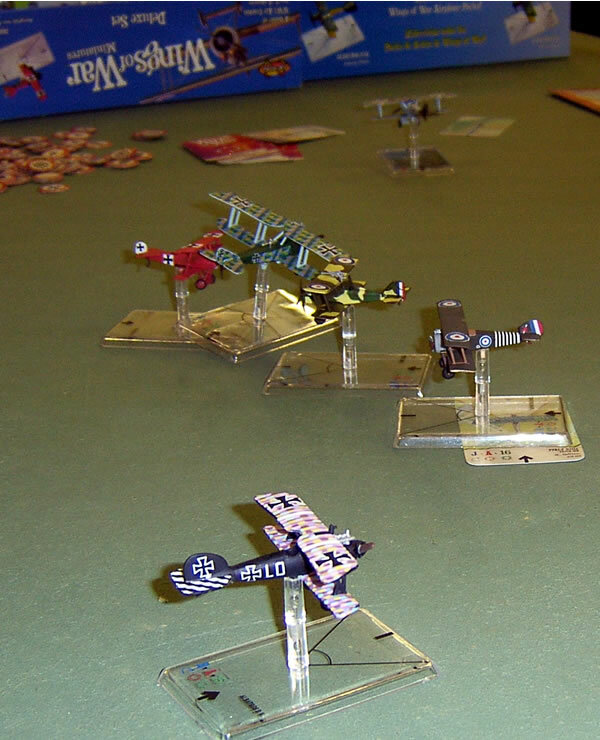 However fail two or three orders at once and initiative passes to the other player. This makes for fast play, there being only a small number of basic action types. Measurements (and scales) are fairly short, so that no more than a four foot square table is required (we found using the scale recommended for 40mm figures to be most pleasing with our 28mm models). The rules contain troop details for five major nations, and a number of scenarios; we tried the Raid scenario, and found it functional, but a little basic. Still this is a set of rules that certainly allow a game with 20 or more figures per side to be played out in only a couple of hours, and one free of confusion. Definitely worth playing. Mmm yes, all over the place isn't it? In this particular instance of course I refer to my Warhammer army, now nearing some kind of conclusion, for the time being anyway. A mass of oddments needed completing, and some of them are still on the go; but this is the first of three character models underway. Another classic Dogs of War model I've been gifted. And so we have a (rather distant) army shot of the whole force at present. Some 200+ models. 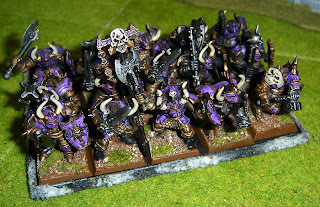 I think it's time to begin a new fantasy project, I have a pile of undead to do of course, but they are going to be a simple jobs and are not a new project. There are a handful of Dogs of War to complete at the minute and may be new units in the future, but as yet nothing pressing. Rather I am considering something radical for me, an altogether more creative project; exactly what is yet to be precisely clear, but the ideas are forming. 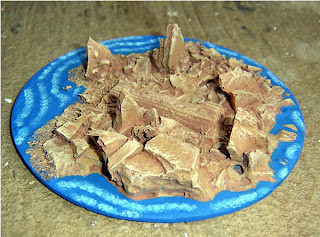 Warning, the following blog entry contains painting and basing that some viewers may find distressing. Those of a sensitive nature should turn away now. So myself and Jason have tussled between my Dogs of War and his Vampire counts several times this year; but both of us own each army, and so I relented (having permitted them back on a table for KOW) to using my hideous undead for a rematch with the sides reversed. 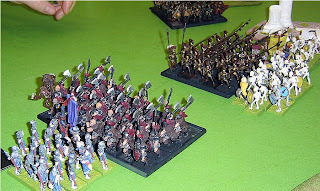 Now, I'd not so much as read the new VC army list, but I knew what units seemed to work for Jason so that was a starting point; for Jason's part, he was able to conjure up a DOW army to match a VC force, which would also give me ideas of how to tackle his force in future. I went with a Pair of thirty strong Skeleton regiments, back up by a 20 strong spear armed unit and a 18 strong unit of Graveguard with Great Weapons. An 8 strong unit of Black Knights accompanied two of my Characters for punch, Whilst a spirit host and Bat Swarm covered the other flank as a high mobility attack. 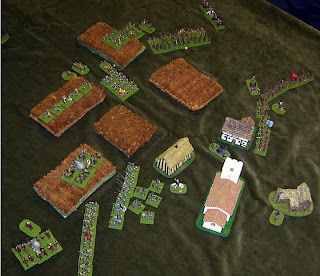 By Contrast Jason used two very large pike blocks and a massive unit of Bearmen, led by Beorn the Werebeast. Those aside he had a unit of Crossbows, A unit of (unpainted, rather spectral) light horse, a smaller unit of knights and some militia. I advanced to open trying to draw his frenzied troops out of the line, whilst My Knights seemed to draw all the fire. I wasted a unit of Dire Wolves attacking his light horse. 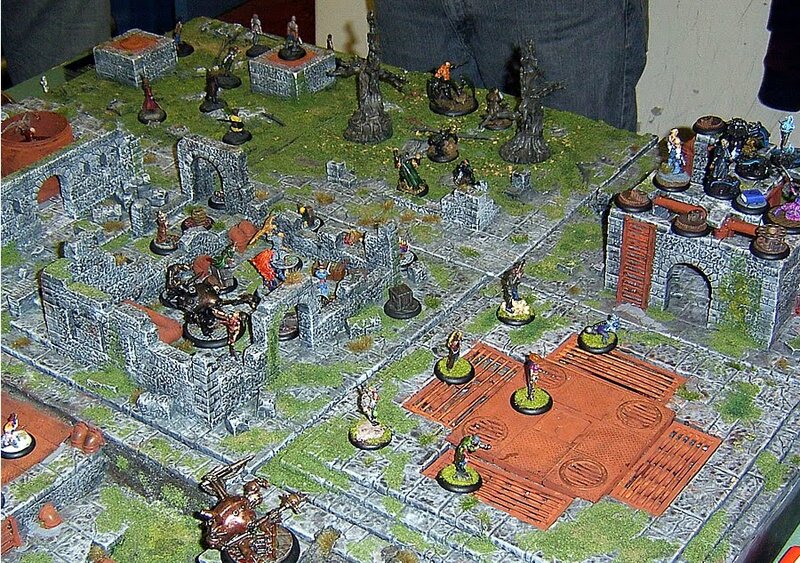 The Spirit host and bats threatened his flank, but as yet Jason was rightly unconcerned. 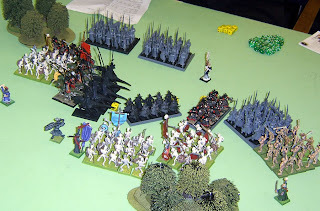 In time, Magic wiped out my Knights for no loss to Jason, though my Characters split up and the Wight Lord with them at least was able to chase off the phantomic light horse. A unit of Ghouls did what the Knights could not and charged the enemy heavy cavalry. 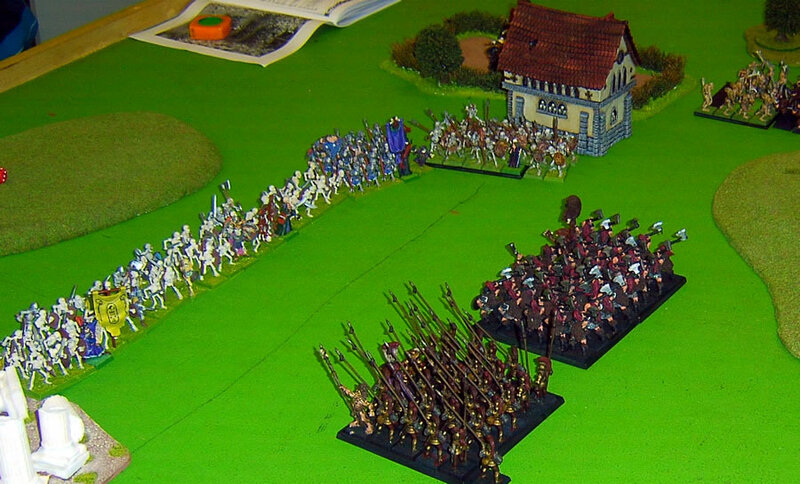 The rest of the Skeleton host formed a well anchored fighting line and set the trap for the Bearmen to fall in to. Which they did, committing the rest of his line to a risky charge. It nearly paid off, but the Necromancer leading the unit of undead they charged just survived (on one wound; about the only bit of luck going my way!) leaving the Beserkers high and dry for a flank charge. 1,1. The roll of two dice destroyed any hope I had of a victory. Instead of crashing in to the flank of his next unit causing panic and disarray, and perhaps allowing me to continue the breakthrough. The Bearmen turned to face their foe. It was as good as over. The Dice gods betrayed me at every turn in this game, and I had every chance to win once the trap was laid. Granted my flank forces performed dismally and in terms of Magic I was completely out classed (I summoned 5 skeletons all game). 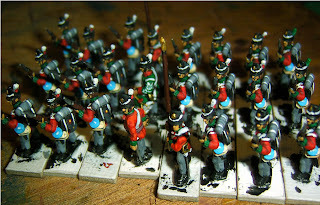 I have a lot to learn about using the VC, and as I have another 130 models to paint for the army I should get learning. 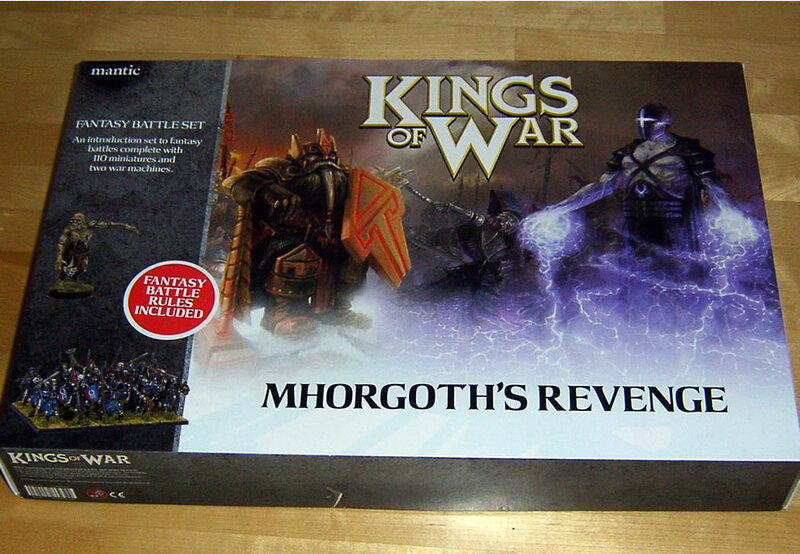 Got hold of the new boxed starter set for Mantic Miniatures' Kings of War fantasy rules, and a great little bundle it is too. 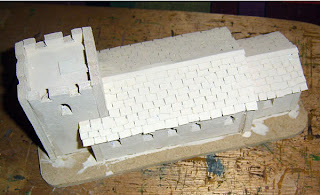 And in fact it would be possible to stretch that number even further, by judicious use of the various little extras on the sprues. The contents are Undead and Dwarves. 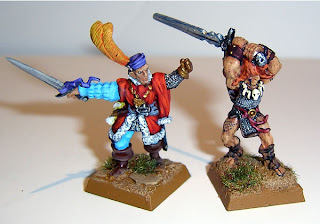 Now I've gone on record in the past as not really liking the Dwarves, GW has them to a tee so far as I'm concerned. They're fine models, but not my tastes. 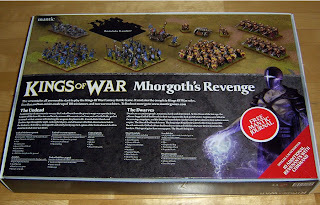 Still this was no problem as Ross at the club was happy to swap the Dwarves for the Undead from his own copy, soon enough I had a 130+ models to cram back in the box. 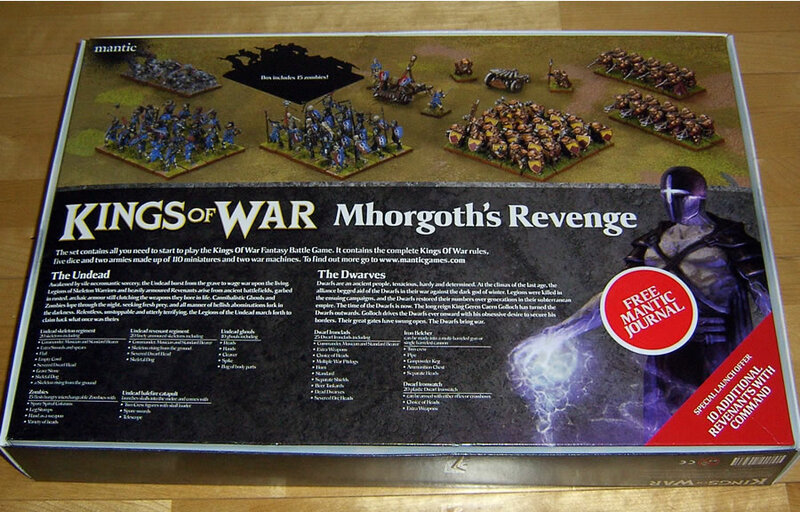 Alongside that you get a copy of the complete rules, all 12 pages of them! And the background fluff, company magazine and dice one might expect in a set like this. No unique bonus models or terrain, and no 'whippy sticks' differentiate this from its' major competitor but frankly for the price I'm not complaining. With my swaps and the initial discount I got on the set my purchase worked out as 24p per figure! Even that aside, with a retail price of £40 and 110+ figures, it competes well with the £60 tag for 74 models of the latest edition of Warhammer; even if that does provide a much more substantial rule book. 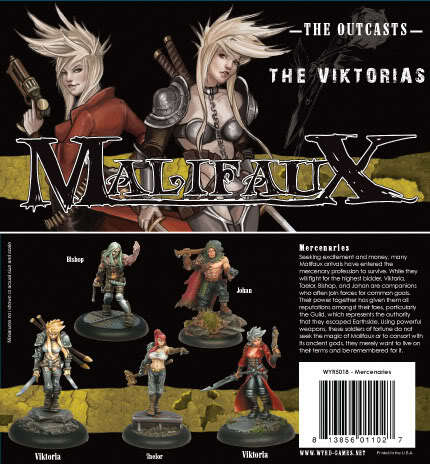 Overall, for fantasy battle fans this is a great intro set, with plenty to get a new player or veteran enthused. 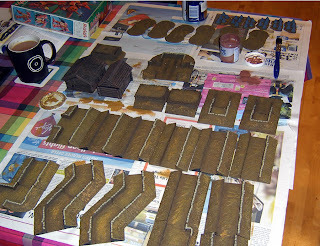 Not mine you understand, but for the club; one of my regular WFB opponents and all round good egg, Jason, donated a mass of resin buildings and trench works for 15/20mm gaming. 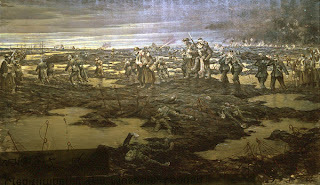 A Flames of War collection he felt he no longer needed for his forces! 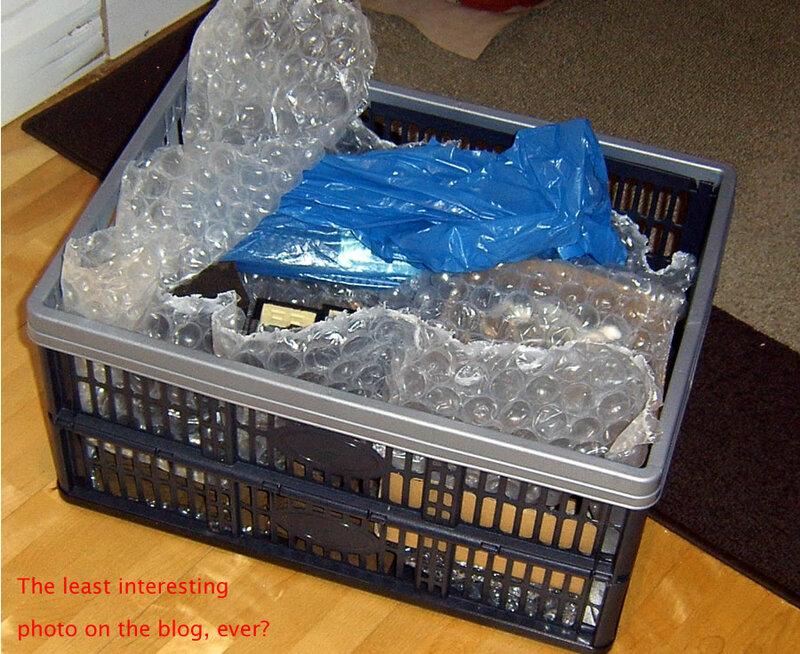 It literally filled this carrying crate! 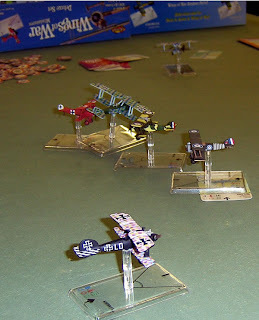 So anyway, after baulking at the task before me I eventually dug out a selection of the models and set to work. Thankfully Jason had painted all of the models already, but only to a basic level; but one that served well as a base coat. My task was only to drybrush and add a little texture to the models. About four feet of trench, with supporting minefields, tank traps and strong-points. 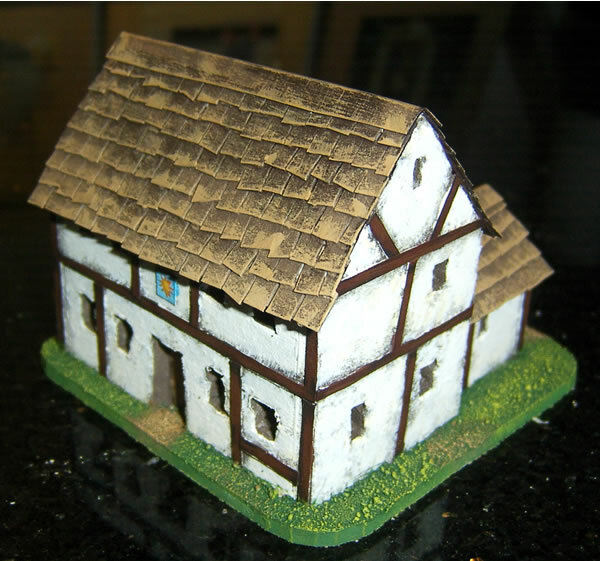 Also two out of six buildings I eventually finished. The terrain is Kerr and King apparently, and really nice it is too. Obviously 15mm, but with the trenches designed to accommodate Flames of War bases, there's plenty of space for 20mm models to fit in. 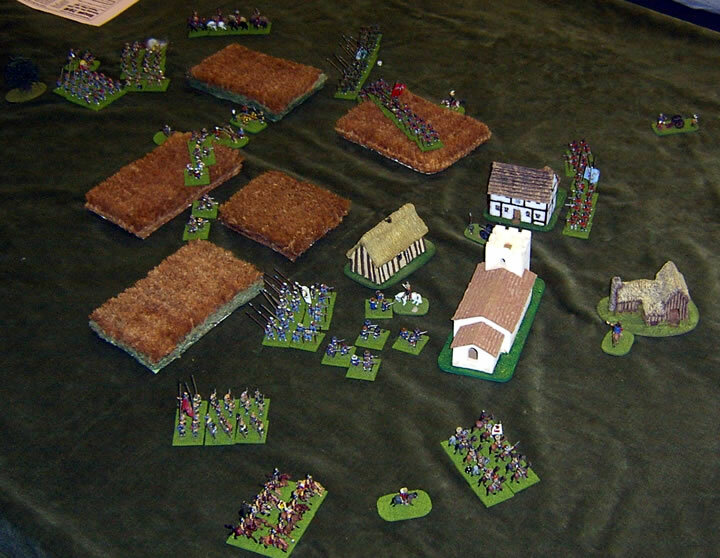 more than 25 years ago I played my first game set in the English Civil war, and it too centred on the capture of a village with a prominent church. This game was in some respects reminiscent of that seminal game. 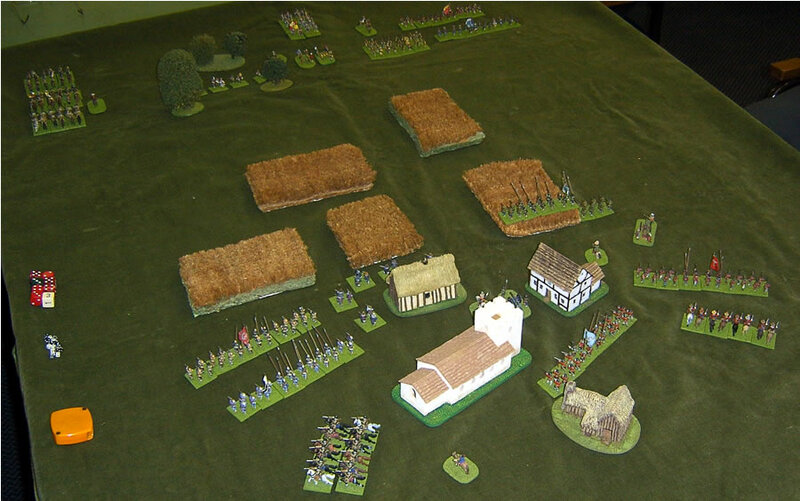 The Royalists, under my command Began from the north of the battlefield, with a large force of Horse on my right and infantry to my left, I hoped to sweep round the farmland surrounding the village; and outflank the Roundheads. They (under Gav's command) had two smaller infantry forces either side of the village, and a limited force of cavalry. Their orders were to defend the village in close detail. 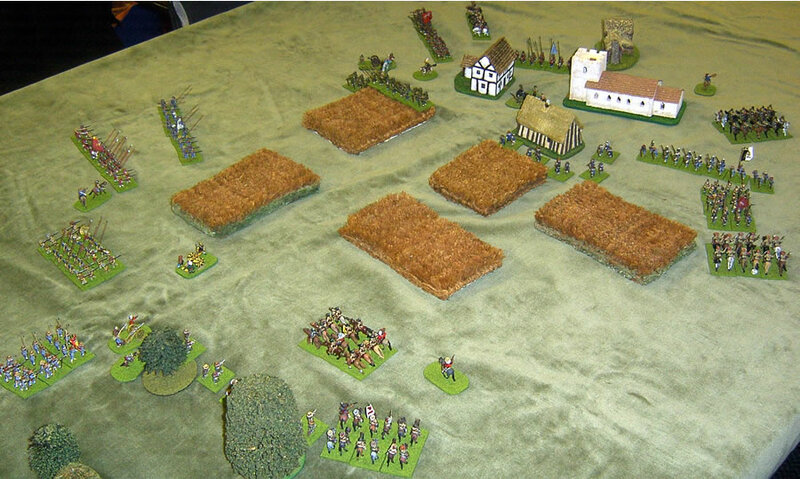 My Royalist Horse made a sweep around the flank, forcing the enemy to draw into stand of pike. Meanwhile my infantry began to advance on my left. In the centre the threat of an artillery duel was forestalled by the poor state of the roads. 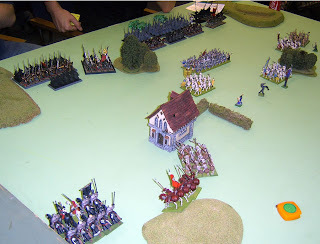 The Parliament Horse, Heavy on my right and Dragoons on my left, began to counter attack, with some initial success. 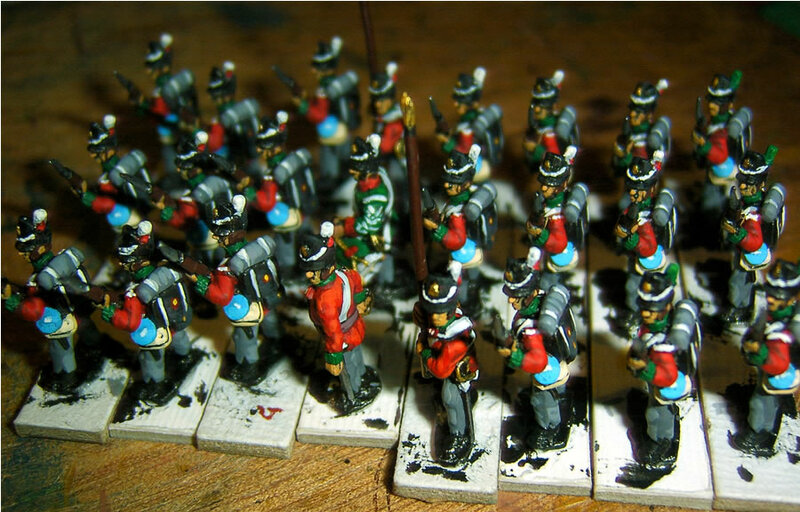 My infantry on the left however were not swayed by their presence, knowing them as little more than an harassment. Still the Parliamentary guns were advanced too to face us and were giving small fire upon our ranks. I lost one unit of horse, but routed Gav's heavy Horse in a counterattack. My Horse now attempted to catch the foot unready, but without fortune. 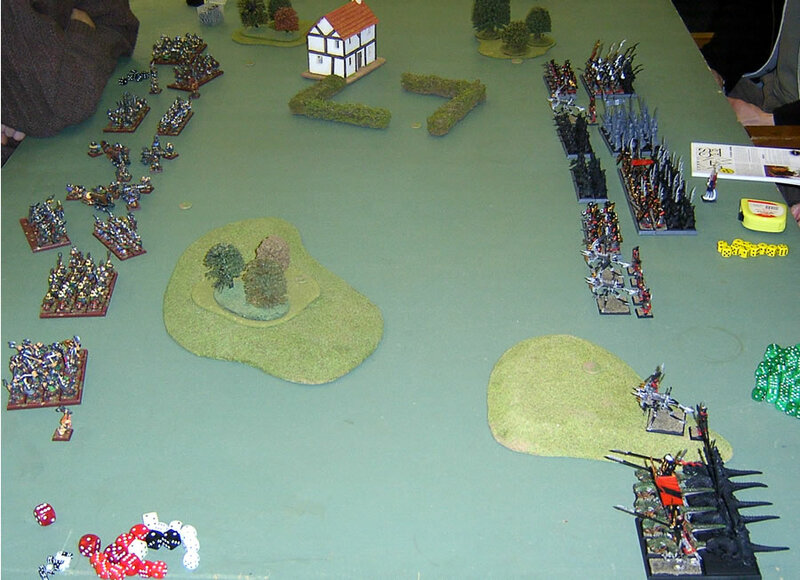 On my Left there was the push of Pike as infantry clashed, whilst in the centre my troops finally made progress down the road. Alas my infantry came out of the battle bloodied and too weary to put up a fight, their greater local numbers proving no help. Now the Dragoons were a true threat to us, and our retreat was in danger of becoming a rout. Still my horse should have offered a glimmer of hope, but at this moment the chose to quit the field in favour of looting the baggage train. To be honest I write it as a close run thing, but really I was comprehensively beaten by Gav! 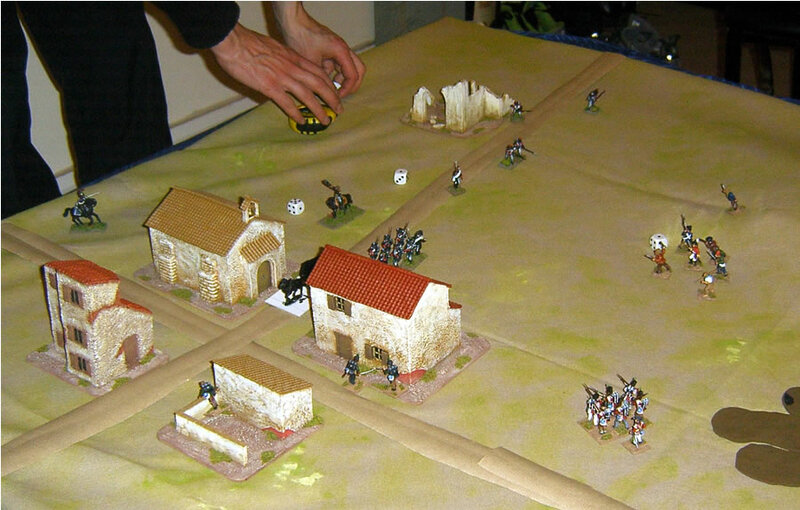 Fun with Black Powder as ever, but my dice rolling and tactical acumen were sorely lacking on this day. 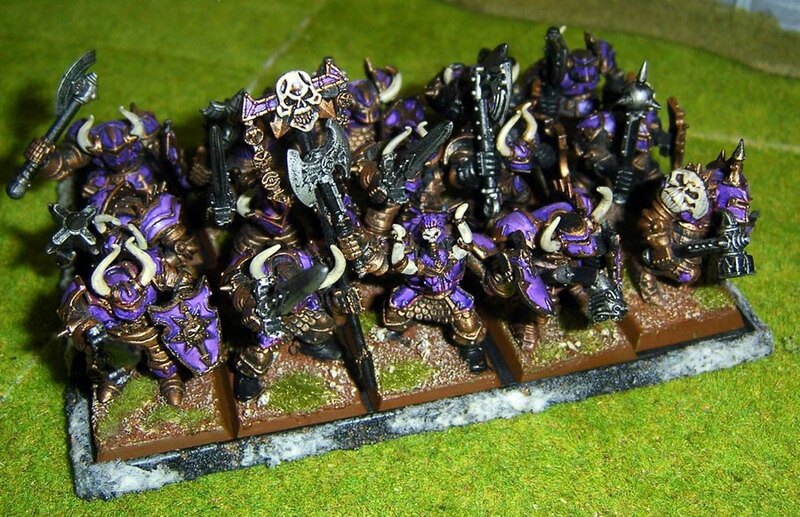 Of course the mainstay of the club is GW games, and in one of those, this unit of Chaos Warriors caught my eye. 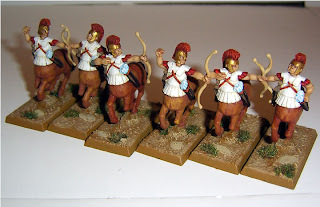 Well after a quiet couple of weeks on the blog, and certainly not mentioning much on the 28mm plastic historics front lately, there's now so much to get in! They are also set to produce their long mooted Ancient Greeks soon too. 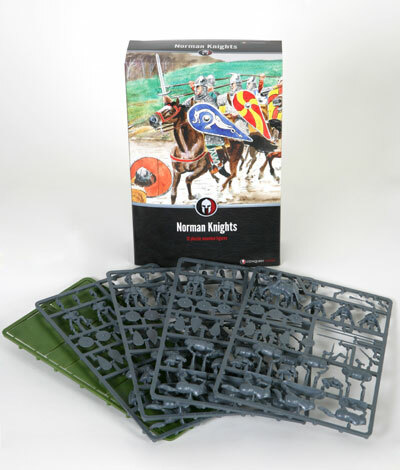 On top of which they have released Saxons and I think are about to release Norman cavalry. Warlord Games are adding British Tommies to their Plastic WW2 Germans already available. 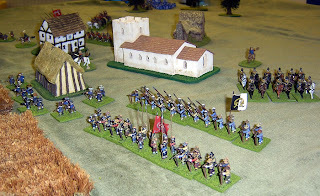 I should also mention that HaT Industries are on with Islamic medieval Spanish cavalry and more variations of French Napoleonic troops, as well as their own take on Prussian infantry; whilst lastly the Perries have announced their upcoming release of Late Medieval Mercenaries; news not yet on their website though known to be in development for some time. 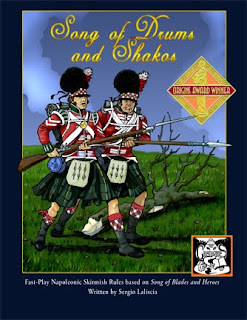 A set to encompass Pikemen, Crossbowmen and Handgunners. It's a pack that will soon find it's way in to my Dogs of War army, I'm sure! 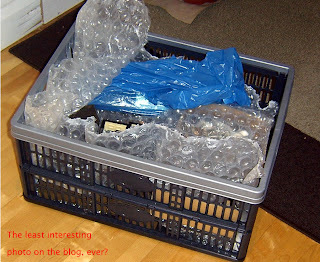 There seems to be no abatement to the the flood of plastic historics being released! 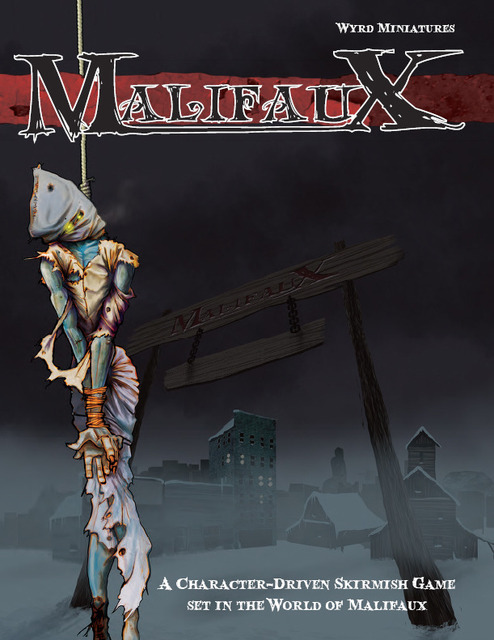 October 31st, aside from being Halloween and Fiasco, was also the day one of our club had organised a tournament for the relatively new, but increasingly popular, game; Malifaux. For those who don't know it, and I speak as a non-player here, it is a game set in a 'Weird Wild West' type setting. Blending Steampunk, Fantasy and Cowboy genres. Anyway, George was the brave chap who organised the day, and well attended it seemed too; with some 18 or 20 players. I can't pretend to know the results of the day, or any other details, but I heartily approve of such endeavours, and it certainly seemed like a good time was had by all. 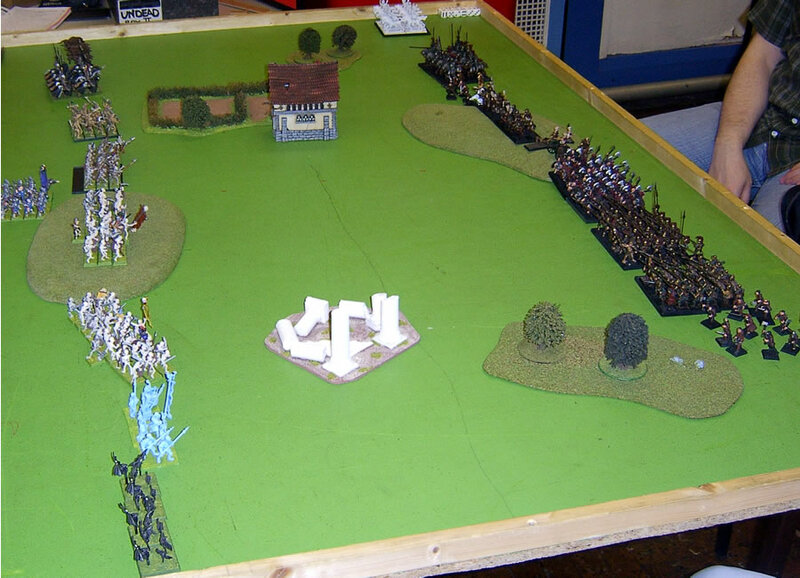 We've had a couple of games of KOW at the club of late, an alternative to Warhammer that avoids WFB's particular style appears to have finally appeared in Fantasy gaming! Not that the rules were perfect yet! 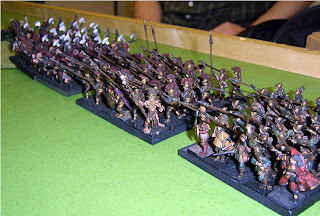 The Elves are the strongest force with the Dwarves a reasonable second and the Undead running a disappointing third. Of course as I say this, some balance has been restored with some points values revised and new rules added to the skeletons. Nevertheless, facing an Elven 'gun line' of 40 bowmen and 4 bolt throwers was the equivalent of going over the top from the trenches. One sided, and no fun at all. In one of the games, my Dwarves didn't manage to inflict any losses on the enemy at all. 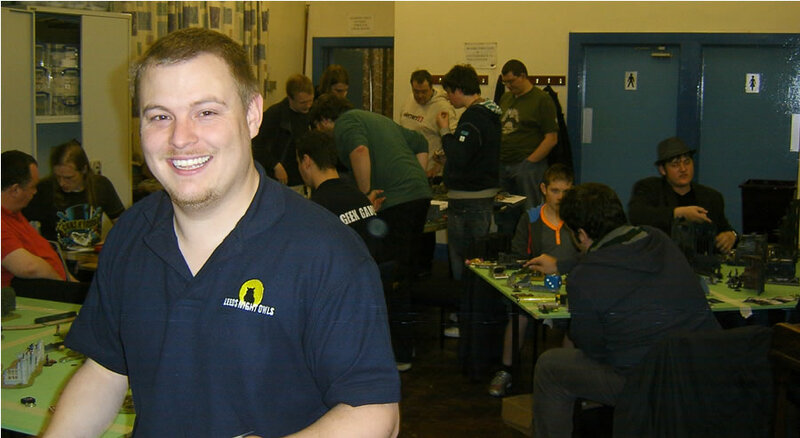 Game balance could kill the rules, but as Mantic Games are producing the rules and army lists for free, and are rapidly making amendments to the lists, it seems likely that problems will be fleeting rather than game breaking. Not as with other companies, whose flawed army lists typically have a 6 to 8 eight year lifespan of being broken. 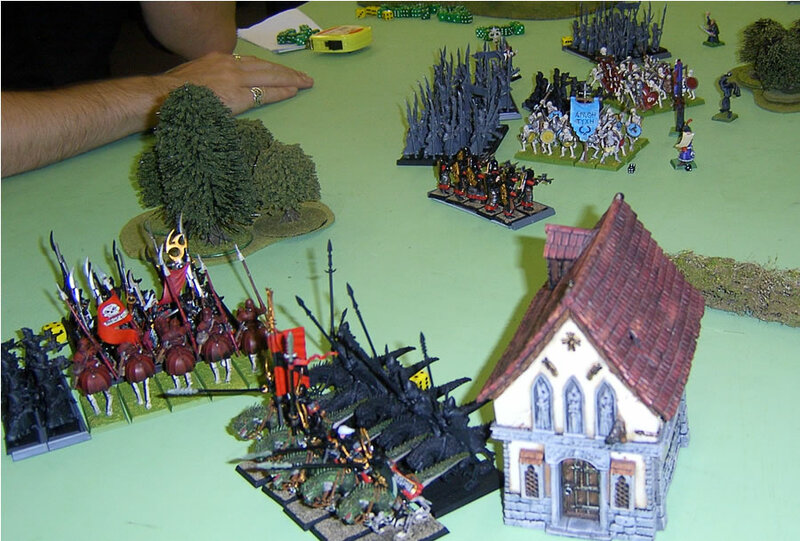 On the plus side, it is a fast game, and both pretty and tactically rewarding (so long as armies are well matched of course). Overall, I like it, and will keep playing it. 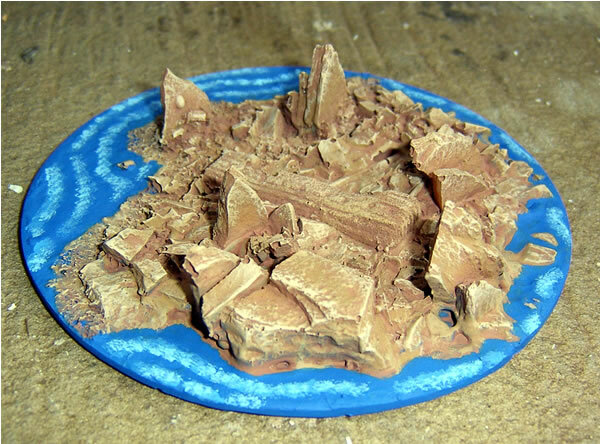 Whereas some of the terrain included more fantasy islands; have to be honest, if I'd not been given these to do for the club I'd probably not have bothered. Far too fiddly. It's a long and bitty list which I'll skip the details on; however it rounds up to 96 points on the month, for a running total of 911 versus the target to date of 500. Above that I'm 50% over my target for the year; but too much terrain again! The time consuming parts of the job are cutting out the windows and tiling the roof. In the raw card the model looks a little crude, so it needs a decent paint job to redeem it. Painting it is the key. Suddenly an acceptable paint job transforms the model. Another easy little job. 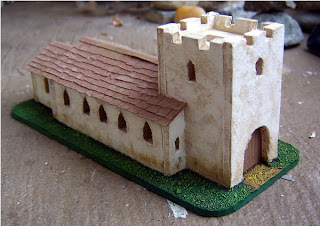 But I need to stop fiddling with terrain and get on with some figures!